DA G18U Black Mounts Epic Comeback to Win GOLD at OC’s !! The last tournament of the Ontario Championships (OC’s) was held in Waterloo this past weekend. With an up and down season, our DA U18 Black girls were ranked 17th coming into the tournament. In the first day of Pool Play, we won two matches against the Oakville Thunder 17U White (25-23, 25-21) and Northern Chill (16-25, 30-28, 15-11) but lost against Aurora Storm Tsunami (20-25, 23-25). As evident in the scores, all the sets were fairly close including a few 2-point set wins or losses. This narrow margin of victory or loss would be a trend for the whole weekend. On Day 2, our DA U18 Black girls were grouped with Oakville Thunder Blue, Cambridge Scorpions and Barrie Elites. To remain in Division 1 – Tier 2, we had to finish 1st in this pool. Otherwise, we would be relegated to a lower Tier for the final day of competition. Our girls breezed thru the first match against the Cambridge Scorpions (25-18, 25-15) by serving tough. That is, we identified some weak opposing passers, and kept serving to them until the passer was either subbed off or the serve-receive formation was realigned. The next couple of matches weren’t so easy. For the second match of the day, we squared off against the Oakville Thunder again, but this time, we faced an older 18U “Blue” team. Having lost the first set, our girls had to mount a huge comeback to claim a 3-set match win, (15-25, 27-25, 16-14). Once again, we had to overcome a first set loss and squeaked by with two consecutive 2-pt set victories. This trend continued into the third match of the day against the Barrie Elites. Similar to the previous match, we lost the first set, but then stormed back to win the next two sets in dramatic fashion (19-25, 25-19, 17-15). Overall, we were undefeated in the Repool Play (3 wins, 0 losses) to remain in Division 1 – Tier 2 for the playoffs the next day. On the final day of competition, we started our playoff matches at 12:40 pm. After getting up at the crack of dawn for the first two days of competition (i.e. leaving the hotel at 6:30 am each morning), this extra bit of sleep and rest would be considered a luxury. And it would definitely prove to be a critical success factor for another grueling day of matches. For the quarter-finals, we faced off against the Cobourg Breakers. In the first set, we jumped out to early lead and never looked back. We cruised to a 25-19 set victory. The second set, however, was the complete opposite. Cobourg jumped out to a 9-2 lead early. Ouch! A 7-pt deficit is typically insurmountable. But it was early in the set, and we started to chip away at the lead. One point at a time. One sideout at a time. One play at a time. Eventually, we were able even the score at 13-13, and then we traded points back-and-forth until we surged away at the end with at 25-22 victory. This trend would be a foreshadowing of things to come. Our girls would be resilient and would always find a way to comeback, no matter how big the deficit. At 17-17, we were finally able to dig up one of Aurora #12’s powerful spikes and matched it with our own strong kill shot down the line. Then we blocked an errand overbump on a tough float serve and scored an ace to take an imposing 20-17 lead. Aurora bounced back the only way they know how… more powerful attacks. Aurora pulled close to try to even the score. But our 6-back defensive player starting digging up some amazing spikes thru the seam of the block and even chased down some tempo-changing tip shots. Our defense trumped their offense, and we held on to win the first set 25-23. The second set between DA and Aurora would go down as the most memorable set played this weekend (and probably at the OC’s). It was epic. Aurora rebounded from this first set loss and jumped out to an early lead. They pressed and pressed and pressed their offense on full throttle. At 24-17, Aurora had a commanding lead and needed only one more point to win the second set. But this last point would prove elusive. As demonstrated all weekend, our DA U18 Black girls were resilient. No matter how big the deficit, our girls would fight back… one point at a time. We continued to serve tough and started to convert free ball transitions. We eventually rallied 7 consecutive points to even the score at 24-24. To win the set, 2 more points were needed. The last points are always the hardest to achieve. It comes down to desire. Both teams stepped it up to the next level. Aurora continued to attack with full swings from all angles of the court. In response, our DA girls stepped it up defensively. We were diving, sprawling, sliding and even pancaking the ball just to keep the play alive. Some of the rallies were absolutely unbelievable. On two occasions (at set point), the ball crossed over the net 11 and 14 times respectively to decide a single point. The lead actually changed sides 8 times after 24-24 tie. Eventually, our DA girls outlasted Aurora in an impressive 36-34 win! Yes, you read this right. Typically, a set would take about 15-20 minutes to play in elapsed time. This second set lasted almost 40 minutes of intense play. Special recognition goes out to Team 12 training, since our weekly conditioning program prepared our girls to maintain their high level of intensive play throughout this marathon set. 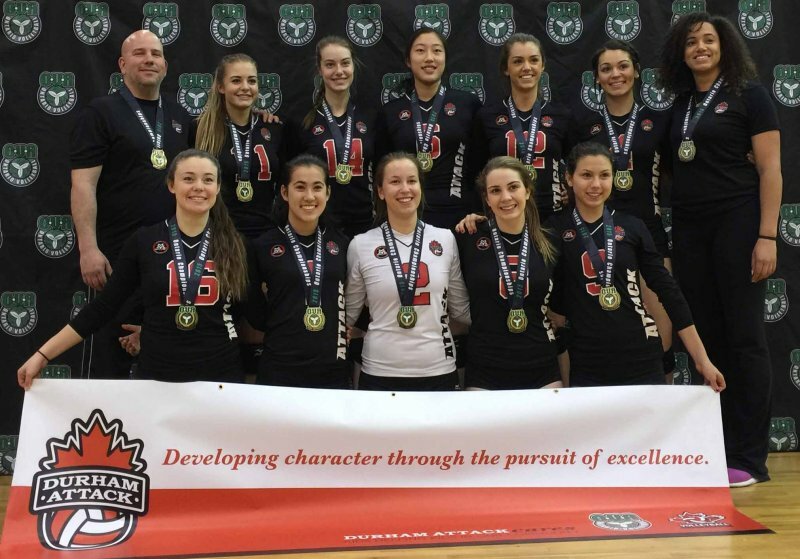 The Gold medal match (Division 1 – Tier 2) would showcase our DA U18 Black girls against the Scarborough Titans Volleyball Club (STVC). We know this cross-town rival very well, and this represented an opportunity to avenge an earlier tournament season loss. The STVC are a scrappy, defensive team with a pair of towering 6’ 3” middle blockers. In the first set, STVC dominated every aspect of the game and won 25-12 in convincing fashion. Our DA girls were definitely outplayed and appeared to be a bit slower. Were our girls emotionally spent from the previous match? With so many tight matches over the 3-day tournament, did the girls have anything left in the tank? Were they too tired to compete for the gold medal? Nope. Once again, our girls responded in the second set with their backs against the wall in a yet another “must-win” situation. We raised our energy level and fought toe-to-toe for every point. Most significantly, we limited the amount of unforced errors and eventually pushed thru for a 25-22 set win to force a third and deciding set. In the third set, our DA girls executed a well-designed game plan. We tried to serve away from the libero, who was clearly their best serve-receive passer. In the first set, this STVC libero took most of the passes and provided their setter with all three hitting options at the net. By keeping the serve away the libero, the passes wouldn’t be as accurate, and their offense would be limited. Still, it was a back-and-forth affair. Both teams battled for every point. Neither team was able maintain more than a 1-pt lead. At the turn, we had a slight edge at 8-7. But then STVC scored a series of points including a serve that just dribbled over net followed by a shank out-of-bounds. We bounced back to even the score at 12-12. With the gold medal at stake, the STVC offense started to force sets to their big middle attackers. This tactic was clearly evident, as their coach substituted a taller player for their right-side hitter (for blocking purposes). Since this new substitute didn’t really pose any offensive threat, our girls focused their blocking duties on opposing middle attack. But the height disadvantage would be difficult to overcome. STVC’s middle attacker was 6’ 3”, whereas our middle blocker was only 5’ 7”… that’s an 8” height difference. Yikes! Nevertheless, our girls would accept and face the challenge straight-on. At match point, we received the serve and blasted a sharp, cross-court spike from the right side. It grazed and deflected off the STVC double block, and their back court defense made an unbelievable dig to keep the play alive. But they couldn’t mount an effective counter-attack and provided a free ball over the net. With all three options at the net, our setter looped an inside shoot set in the lane to our shorter middle attacker, hoping to catch their defense off-guard. Unfortunately, the STVC blockers were ready. Their (newly substituted) right-side blocker closed the lane and formed a solid double block with their middle blocker ready to roof the spike. Rather than trying to blast thru the four hands, our middle attacker deftly tipped the ball to her left… to the now vacant spot along the net. DA 18G Black wins the gold medal, 15-13!! Good luck at the Canada National Championships!! OC Wrap-Up and Thank You!